the afternoon did washing with help. It blowed so I only put part of the clothes on the line. Wednesday March 13th 1901 I ironed some this morning and put up my mince meat. I sewed a little in the afternoon. The weather is cold and windy. The boys are barking post to set. Thursday March 14th 1901 I was busy all morning with the house-work and sewed on my wrapper in the afternoon. It was so snowy and bad the boys could not work at all Friday March 15th 1901 I sewed a great part of the day and finished my wrapper. Will walked in town in the afternoon the roads are very bad now. 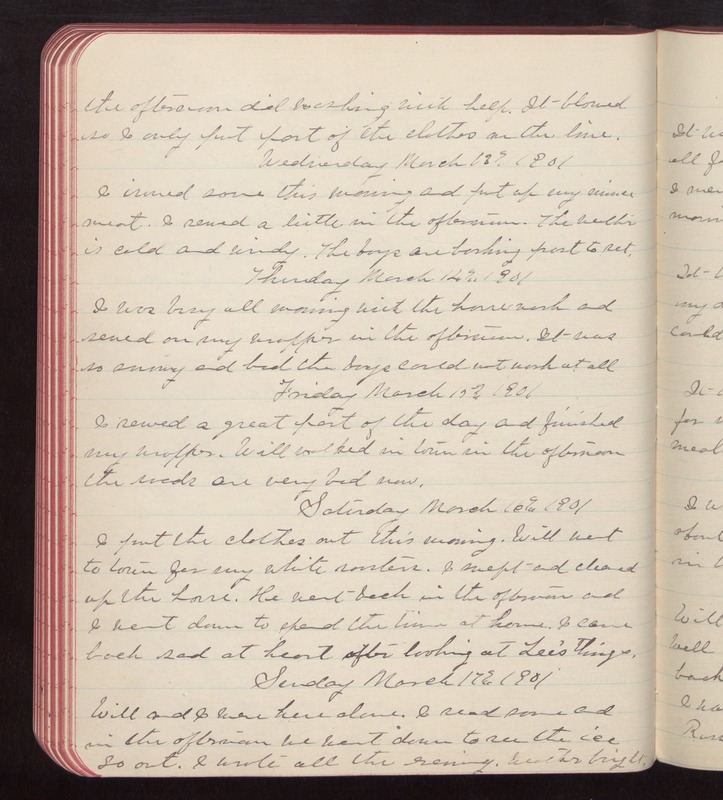 Saturday March 16th 1901 I put the clothes out this morning. Will went to town for my white roosters. I swept and cleaned up the house. He went back in the afternoon and I went down to spent the time at home. I came back sad at heart after looking at Lee's things. Sunday March 17th 1901 Will and I were here alone. I read some and in the afternoon we went down to see the ice go out. I wrote all the evening. Weather bright.